In Peter Thiel’s book, Zero to One: Notes on Startups, or How to Build the Future — more of an exercise in thinking about the questions you must ask to move from zero to one — there is a great section on the single best interview question you can ask someone. This question sounds easy because it’s straightforward. Actually, it’s very hard to answer. It’s intellectually difficult because the knowledge that everyone is taught in school is by definition agreed upon. And it’s psychologically difficult because anyone trying to answer must say something she knows to be unpopular. Brilliant thinking is rare, but courage is in even shorter supply than genius. What does this contrarian question have to do with the future? In the most minimal sense, the future is simply the set of all moments yet to come. We hope for progress when we think about the future. To Thiel, that progress takes place in two ways. 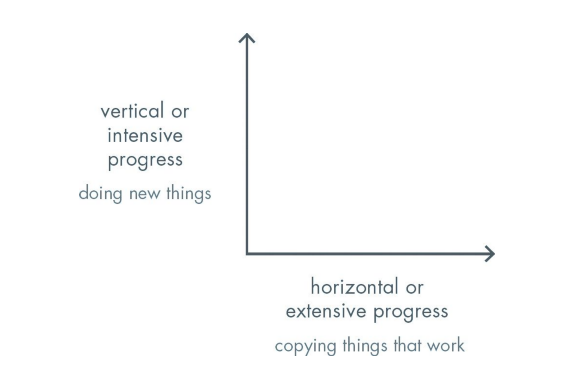 Horizontal or extensive progress means copying things that work— going from 1 to n. Horizontal progress is easy to imagine because we already know what it looks like. 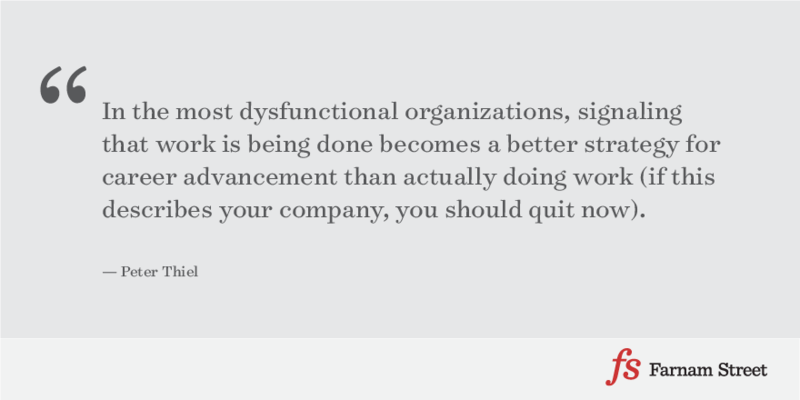 Vertical or intensive progress means doing new things— going from 0 to 1. Vertical progress is harder to imagine because it requires doing something nobody else has ever done. If you take one typewriter and build 100, you have made horizontal progress. If you have a typewriter and build a word processor, you have made vertical progress. At the macro level, the single word for horizontal progress is globalization— taking things that work somewhere and making them work everywhere. … The single word for vertical, 0 to 1 progress, is technology. … Because globalization and technology are different modes of progress, it’s possible to have both, either, or neither at the same time. My own answer to the contrarian question is that most people think the future of the world will be defined by globalization, but the truth is that technology matters more. Without technological change, if China doubles its energy production over the next two decades, it will also double its air pollution. If every one of India’s hundreds of millions of households were to live the way Americans already do— using only today’s tools— the result would be environmentally catastrophic. Spreading old ways to create wealth around the world will result in devastation, not riches. In a world of scarce resources, globalization without new technology is unsustainable.